2018 CROW Photo Contest Winners! Portions of ten counties in Central Minnesota make up the Crow River Watershed. From the perspective of the Upper Mississippi River Basin, the Crow River is one of its major tributaries. The effects of rapid urban growth, new and expanding wastewater facilities and erosion from agricultural lands have been common concerns of many citizens, local, state and regional governments in Central Minnesota. As a result, many groups began meeting in 1998 to discuss management of the Crow River basin consisting of the North Fork and South Fork. 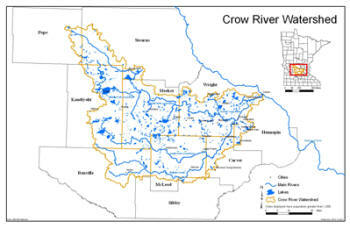 The Crow River Organization of Water (CROW) was formed in 1999 as a result of heightened interest in the Crow River. A Joint Powers Agreement has been signed between all ten of the Counties with land in the Crow River Watershed. The CROW Joint Powers Board is made up of one representative from each of the County Boards who signed the agreement. The Counties involved in the CROW Joint Powers include Carver, Hennepin, Kandiyohi, McLeod, Meeker, Pope, Renville, Sibley, Stearns and Wright. Learn more about your watershed! Thanks to our River Cleanup Sponsors!